As the technological world advances, we are finding new ways of incorporating technology into our lives in order to make them easier. More and more I am finding that facets of my life are moving online and away from traditional methods. My university learning is moving online and much of my assessment is completed online. Even ordering a pizza, a task that previously required face-to-face interaction or picking up the phone, is now something that can be done with just a few clicks online. This technological advancement has moved into retail with the introduction of enterprise tablet pcs; a specialized tablet that is custom built to suit retail and bring improvement not only to the business but customers too. 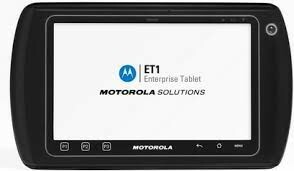 The Motorola ET1 enterprise tablet is a cutting-edge example of this transition to technology. I previously spoke about the tablet revolution we are currently under and this is a key example of it. Whilst consumer tablets have plenty of power and can run a host of applications the ET1 is actually custom made for retail and offers features that a consumer tablet simply can’t match. Firstly, a tablet that is used constantly by an array of employees is bound to end up with a few dings and bumps. I personally have dropped my phone more times than I’d like to recall, a phone case may be the best $30 investment I’ve ever made. Because of this, the ET1 is build from sturdy gorilla glass and is impervious to extreme cold and heat so it can survive just about anything it is put through. However, a feature that really sets it apart from a consumer tablet is not simply its durability but its multi-user access. In retail we have many different positions that will all require different applications. With the Motorola ET1 it is possible to switch and log on with multiple users so that specific users can only access the applications that are relevant to them and less tablets will need to be bought. Further to this, an IT staff can simply update all the tablets from a single location as well as ensure that all problems with the tablet are resolved before they snowball and impact productivity. This tablet proves especially beneficial for sales people who are out on the floor associating with customers. Picture that you walk into a store and are tossing up between different models of dishwasher. The sales person approaches you with a tablet and then proceeds to show you side-by-side details of both brands and is able to weigh up the pros and cons of both models interactively for you to see. The information is right there at your fingertips and when it comes to payment, there is no need to wait in tedious lines – the tablet has many external ports one of which is magnetic stripe reader meaning it can read credit cards, making payment effortless. If this has you worried about security this is covered also with all data on the tablet and external media cards being encrypted and can be wiped should the tablet be lost. The tablet is further useful for training staff. As staff move around the store they can then view videos of products and procedures on the tablet in order to aid in their learning and training. You may be thinking at this stage that your phone or iPad doesn’t even last a day without charging. With the enterprise tablet this is taken care of with the battery being completely replaceable so that when the battery is running low there is a 15-minute time frame where the battery can be removed and replaced with a new one without any loss to the current user session. This alongside multiple battery docks ensures that the battery will never run flat on the tablet. As time goes by, technology will become more embedded in our society and help make our lives even easier. With the introduction of the retail tablet computing devices we may be on the cusp of an overhaul of the way in which retail is run. I for one am excited to see what the next technological advance will bring and what the future holds.